When you are hatching eggs at home, you may not always get a 100% hatch rate. Some eggs may not be fertile to begin with. These infertile eggs are called “yolkers”. There are then some eggs that will stop developing at some point during the incubation process. These are referred to as “quitters”). It is very important that you are able to identify and remove these yolkers and quitters during the incubation process; otherwise they can begin to rot and then burst inside the incubator, contaminating the other eggs with bacteria and at the same time creating a very bad smell. Using the correct candling equipment. Candling torches doesn’t have to be very complicated or expensive. In the earlier days, candling used to be done with the flame from a candle. This is in fact whether the name ‘Candling’ came from. The most important thing is a bright light with that is directed through a small opening on an opaque object. The opening should obviously be smaller the size of the egg since you will be placing the egg on the hole. You will need to conduct the candling in a relatively dark room in order to clearly see inside the egg. It is advisable that you candle your eggs before you even put them in the incubator. You probably won’t be able to see anything, let alone differentiate between good and bad eggs, but it will give you an indication of what an undeveloped egg looks like, which can be useful for comparison later on. You may also get a more advanced, and of course more expensive, option for candling eggs which is known as an OVASCOPE. Ovascope has a rotating stand on which you place the egg. Then the egg is covered by a hood which prevents penetration of any ambient light. Then you can view the egg through the eyepiece. The egg is magnified for easier observation. You should candle your eggs before you even put them in the incubator. You probably won’t be able to see anything, let alone differentiate between good and bad eggs, but it will give you an indication of what an undeveloped egg looks like, which can be useful for comparison later. It may also be helpful to look out for any tiny cracks which are not visible to the naked eye. Cracked eggs are more susceptible to harmful bacteria getting inside and affecting the development of the embryo. If you find an egg with a crack, do not discard it just yet, but make sure to take note of the crack and check the egg’s progress later. Although some people will candle their eggs every day while they are incubating, it is a good idea to wait until about day seven. There are two reasons for this. 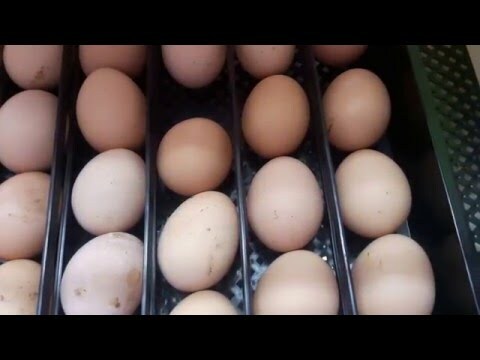 Number one: Eggs are temperature sensitive and constantly moving them in and out of the incubator could negatively affect their development, especially at this early stage. Number two: Before day seven the eggs will not have developed very much and it will be difficult to distinguish between good and bad eggs. After the candling on day seven you should leave the eggs alone til about day fourteen. At this point, you will be able to double check any eggs that you were uncertain about the first time and discard them if there are still no signs of development. You should refrain from candling after day sixteen or seventeen, as the eggs should not be moved or even turned in the days leading up to the hatching. In addition, the embryos will have developed so much by this stage that they will fill the inside of the egg, so you will be able to see very little.